I didn't know quite what to expect. A line of tents with gypsy fortune tellers? Tarot readers? Crystal balls? Energy Healers? Astrologers? People channeling their spirit guides? Regression into past lives? Sellers of Crystals and magic potients? Would my booth partner, Michele of Hurrikayn Natural Soaps, and I be the only ones with products you can touch? Would we feel out of place? Would anyone buy our wares? Well, yes, there were astrologers and Tarot readers, crystal balls, and spirit channelers. There were energy healers and Reiki practitioners, people doing spirit cleansings and healings of many kinds. The energy of all the venders was for healing, helping, and loving. *L'aura Grace told me she was healed of a 17 year chronic bladder infection when she connected with energy healers using light. She now channels this light for others with the help of an Angel (whose name I've lost). I had just read in Ode Magazine of the light that transmits healing messages to our whole bodies. Sounds kind of woo woo, but I have used this concept and it works! *Dolly Mae wrote a book: Choosing Joy in the Midst of Crisis. Her premis is that one can choose to live in fear--or to live in Love. Living in Love leads to a joyful life. 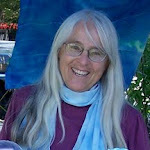 She is teaching "A Course in Metaphysics" Wednesday Evenings in Everett. Choosing to respond to life with love rather than fear has been my path for awhile now. *Robin Ritter is a "Certified Oneness Master". She practices I'O Mastery Healing, a form of healing founded by Laurie Keako'a Grant of Hawaii. What I saw her doing reminded me of Reiki, which I used to help my husband when he was sick with cancer. And no, no one bought my scarves or cards, but I did have fun! Michele did sell enough soaps to pay the booth fee and perhaps a bit more.